A change of direction and change of speed are crucial to successful dribbling. Change of direction is the ability while dribbling to alter course to the left or the right or a 180° turn. Change of speed while dribbling could be from slow to fast or fast to slow, to come to a complete stop or to move from a standing start. Play 3v3 in a 30 x 20 yard grid. Put the two groups of three into different colored training bibs. Each player in one group has a ball. Attacking players must dribble past defending players. The defending players should try to gain possession and (if they do) then dribble past an opponent. Players may dribble in any direction inside the grid to start. 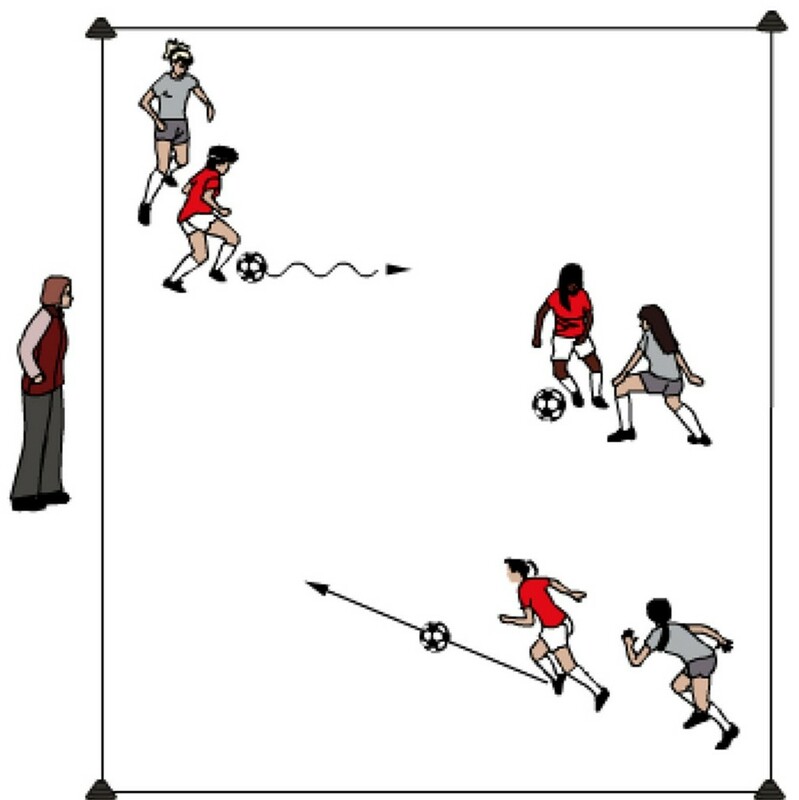 The activity can progress when the coach gives the attack a direction (e.g., dribble to a specified goal line). Play a round for a set amount of time. After a round the groups switch roles. Coaches will try to teach and players will try to learn ‘moves’ for dribbling through the use of fakes and feints. Yet what is the distinction between a fake and feint? A fake is a move that is done with the ball; actually moving the ball. A feint (body swerve) is done only with the body, no contact with the ball until the player in possession finally plays the ball. A fake is done with the feet. A feint could be done with almost any part of the body. The goal of either a fake or a feint is to get the opponent off balance (wrong footed) or going in the direction opposite of where the player in possession of the ball really plans to go. When using either a feint or a fake subtle control of the body is required. The center of gravity should not be moved too far sideways from the body’s midline. If the body weight is unnecessarily shifted in the direction of the swerve, the player will find it difficult to make a fast second move. Changing direction quickly during a fake requires the player to keep a low center of gravity until the second move is started. Coaches must be cautious with the systematic instruction of feints and fakes. In coaching, the main thing is to develop the abilities that will help the players in making effective ‘moves’, such as speed, mobility and a sense of how to shift the center of gravity economically. Once a player is comfortable with the basics of dribbling then cunning must become a part of the skill.